In my experience of working with The Unstuck Group, I typically see common denominators of stuck churches. In addition to attendance, other things decline as well. Unfortunately one area that usually takes a negative hit is the number of baptisms. 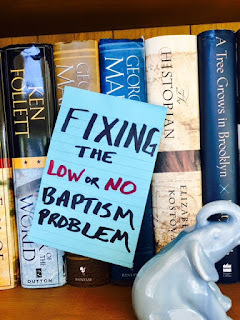 When helping churches build vision, I ask, “How many people do you think you’ll baptize in five years?” If the church has a history of low or no baptisms (which most stuck churches do), this question causes the team to pause. If there’s one bullet point that should be a part of every church’s vision, it’s reaching people with the gospel. It’s biblical. Jesus reminds us of this during a conversation with Peter after a fishing trip (Luke 5:10). At the end of the day, Jesus has called the church to fish for people. Unchurched people.